McIntosh–Goodrich Mansion, 1584 N. Prospect Ave. Photo by Dave Reid. For this stop on my Doors Open tour of Milwaukee I visited the McIntosh–Goodrich Mansion at 1584 N. Prospect Ave. My last visit to this building was, well, less pleasant. 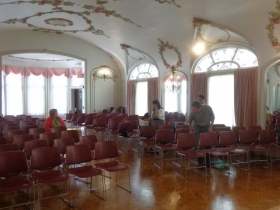 I was covering a community meeting about New Land Enterprises’ proposed Transera project, a $60 million, 27-story high-rise condominium building, that was to be located on the Goll Mansion property at 1550 N. Prospect Ave. The Helen Bader Recital Hall was hot and so was the crowd, most of whom lived in 1522 on the Lake and opposed the development because it would impact their view. What they heard at the meeting certainly wasn’t music to their ears. Although Transera was never built, Dominion Properties LLC is proposing to build Sage on the Lake, a 10-story, 60-unit green apartment building, on the same site (Update: In 2016 Dominion sold the property to Madison-based developer Palisade Property. In 2017 DCH Properties, an affiliate of Palisade Property, received a recommendation of approval from the City Plan Commission to develop a 27-story tower on this site). 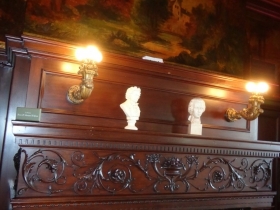 This visit was far more relaxed and allowed tour goers to see and hear (a student was playing the violin in the recital hall) the beauty of the McIntosh–Goodrich Mansion. 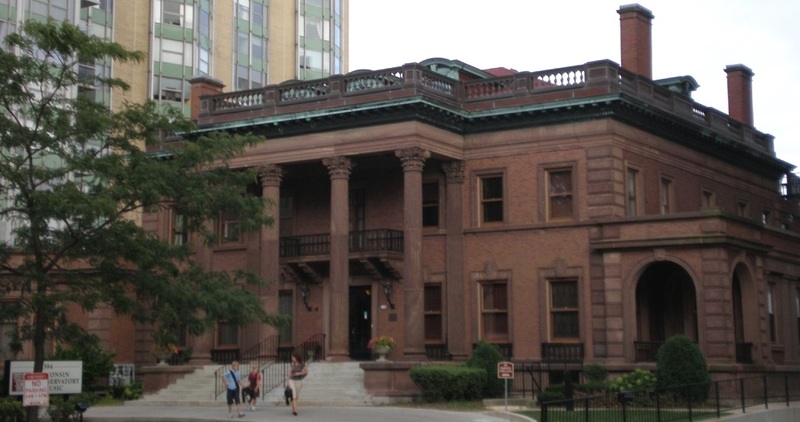 The McIntosh–Goodrich Mansion is one of the few remaining historic mansions along this stretch of N. Prospect Ave. 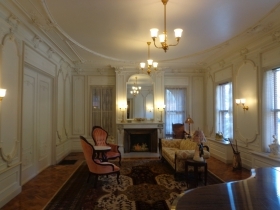 It was built in 1903 by New York-native Charles L. McIntosh and designed by architect Horatio R. Wilson of Chicago. In 1921 McIntosh sold the house to William Osborne Goodrich. Goodrich’s wife Marie Best Pabst was the daughter of Frederick Pabst. 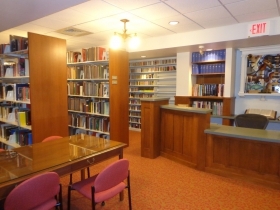 It is listed on the National Register of Historic Places, and rightly so. 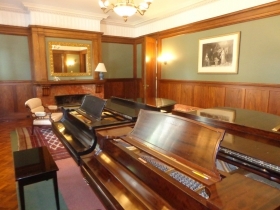 The Wisconsin Conservatory Of Music has called the McIntosh–Goodrich Mansion home since 1932. 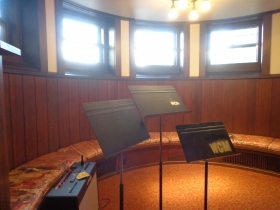 The school teaches thousands of students a year, and offers group classes and individual instruction in both vocal and instrumental music. Today, the organization has an annual budget of $2 million. Fun Fact: Liberace, and former Mayor Carl Zeidler were both students of the school. I took ballet lessons here back in the 1970’s. William Reilly was the instructor, quite mean. And the beautiful windows are Louis C. Tiffany, the real deal. I never knew that the Conservatory was formerly a private mansion (although it makes sense, doesn’t it, on Prospect Avenue? ).